vAPV Virtual Application Delivery Controllers improve application availability, performance and security while enabling dynamic, flexible and elastic provisioning in cloud and virtual environments. Powered by Array’s 64-bit SpeedCore® platform, vAPV virtual application delivery controllers extend Array’s proven application availability, acceleration and security capabilities to virtualized data centers and public/private clouds. Combining the application delivery and traffic management features common to all vAPV virtual application delivery controllers products with the flexibility afforded by a virtualized infrastructure, vAPV virtual application delivery controllers enable dynamic payas-you-grow scalability and new elastic business models for both development and production environments. Able to integrate seamlessly with cloud management systems for automated service provisioning, vAPV virtual application delivery controllers are the ideal choice for enterprises, service providers and other seeking scalable and flexible application delivery and load balancing with the ability to improve data center efficiency and enable profitable cloud service offerings. vAPV virtual ADC appliances include all features and software modules found on Array’s vAPV virtual Application Delivery Controller dedicated appliances. vAPV virtual application delivery controllers ensure 99.999% uptime for applications and services. Leveraging robust distribution algorithms, health check mechanisms, clustering and failover capabilities, vAPV virtual application delivery controllers appliances maintain connections, ensure persistence, direct traffic away from failed servers and intelligently distribute application services across multiple servers for optimized performance and availability. Customized traffic management is often a trade-off between performance, control and ease-of-use. Unlike ADCs that rely on complex, computeintensive scripting to enable custom Layer-7 policies, Array supports a vast library of policies that are hard-coded at the kernel level, are configurable with point-and-click simplicity via the WebUI or CLI, and can be combined and nested to create advanced customized application traffic management. With Array's unique approach to Layer-7 traffic management, customers get the best of all worlds: ease-of-use, granular control and superior performance and scalability. SSL acceleration reduces the number of servers required for secure applications, improves server efficiency and dramatically improves application performance. Offloading compute-intensive key exchange and bulk encryption, and delivering industry-leading client-certificate performance, SSL acceleration is ideal for scaling secure SaaS services, e-commerce environments and business-critical applications requiring high-volume secure connectivity. Although more secure than the old 1024-bit standard, 2048-bit keys are five times more compute intensive and can impact both performance and the cost of supporting applications. Array 2048 and 4096-bit SSL encryption offers unbeatable scalability and performance with the lowest-cost per SSL TPS to offset transition costs and improve security without impacting performance. With WebWall™, Array's suite of Web application security capabilities, vAPV virtual application delivery controllers can protect against denial of service (DoS) and malformed URL attacks and allow a wide range of Layer 2 through Layer 7 protective policies to be stacked atop one another for increased security. vAPV appliances are security-hardened to protect applications and servers from L4 and L7 DDoS attacks and support content filtering to guard against Syn-flood, tear drop, ping-of-death, Nimda, Smurf and other malicious attacks. vAPV appliances also feature extensive access control lists, network address translation and stateful packet flow inspection – all executed at the kernel level – to guard against attacks and unauthorized access without impacting performance or scalability. In addition, integrated Web application firewall capabilities provide deep application data inspection – beyond IP and TCP headers – to deal with attacks such as SQL injection and cross-site scripting. Deployable in front of multiple Web or application servers, Array's Web application firewall detects and responds to signatures for known application vulnerabilities and is programmable to deal with future threats. Link load balancing (LLB) and global server load balancing (GSLB) ensure 99.999% availability for wide area network (WAN) connections and geographically dispersed sites. Link load balancing with end-to-end health monitoring and dynamic routing detects outages and monitors performance in real time to distribute traffic across multiple WAN connections for a premium, always-on end-user experience. Ideal for geographically distributed applications and multi-site architectures, global server load balancing directs traffic away from failed data centers and intelligently distributes services between sites based on proximity, language, capacity, load and response times for maximum performance and availability. vAPV virtual application delivery controllers appliances leverage multiple acceleration technologies and optimizations to deliver a premium end-user experience for a wide range of applications and data services. Inmemory caching increases server efficiency and improves seek and response times by over 500%, hardware and software compression can reduce bandwidth utilization and end-user response times by more than half and TCP connection multiplexing aggregates millions of short-lived client connections into persistent fast lanes that increase server efficiency by up to 70% while improving application performance. Where Array's Layer-7 policy engine cannot meet application traffic management requirements, ePolicy scripting allows transactions and content to be manipulated to achieve traffic distribution that improves data center efficiency and mitigates the effect of delivering applications over the Internet. Using eRoute, inbound and outbound WAN traffic may be load balanced across multiple ISP links based on preset and user-defined algorithms and directed across routes optimized for maximum stability and performance. Additional L4 traffic management features include VLANs, port forwarding, port and link redundancy and the ability to bundle multiple low-cost links to improve bandwidth utilization and reduce costs. In conjunction with ISVs and application developer partners, Array vAPV virtual application delivery controllers appliances have been certified to provide load balancing, acceleration and security for enterprise applications such as Microsoft Lync 2010 and 2013, Microsoft Exchange 2010 and 2013, SAP, Oracle, eClinicalWorks and others. Leveraging deployment guides, businesses can take the guesswork out of application delivery. Following simple step by step instructions, IT can rapidly and confidently configure vAPV appliances for optimized delivery of business critical applications. Traffic shaping optimizes application traffic on WAN links to improve bandwidth utilization and end-user response times. Supporting user-defined policies, vAPV virtual application delivery controllers appliances prevent bandwidth-intensive applications from over-utilizing WAN links and ensure essential applications are prioritized to meet service level agreements. Used in conjunction with link load balancing, global server load balancing and QoS features such as filters and CBQs, traffic shaping can dramatically improve application performance. For organizations needing an IPv6 Web presence, server load balancing protocol translation (SLBPT) transforms existing IPv4 Web sites into IPv6 compatible sites and greatly reduces the need for duplicate equipment, content and management. Where there is a need to make the most of depleted IPv4 resources, NAT and dual NAT (dual-stack IPv6) allow multiple clients to utilize a single IPv4 address. In migration environments, Array IPv6 solutions support both NAT64 and DNS64 to enable IPv6 clients to connect with IPv4 servers and content. To ensure a consistent application experience across IPv4 and IPv6 clients and networks – and to enable fully-capable, next-generation solutions – IPv6 feature parity is supported for all Array vAPV virtual application delivery controllers. vAPV virtual application delivery controllers are simple to install and offer intuitive configuration and management via a WebUI and a familiar command line interface. Using the administration tool kit, network managers can view the status for a wide range of system parameters, enable services on the fly and automate configuration using XML-RPC. Leveraging extensible APIs, application and network intelligence can be integrated with third-party monitoring and management or exported for optimizing complementary data center systems. In addition, vAPV virtual application delivery controllers appliances support VMware vCenter integration for intelligent command and control of virtualized application infrastructure. To meet the deployment and management requirements of load balancing and application delivery in the cloud, Array's eCloud API provides a script-level interface for cloud management systems to manage and monitor Array devices and assist in interactions between cloud operating systems and virtual machines running Array load balancing. For cloud providers and enterprises leveraging the OpenStack architecture for cloud management and automation, Array's integration with OpenStack load balancing-as-a-service (LBaaS) creates a standardized means to rapidly integrate with and control Array technology. 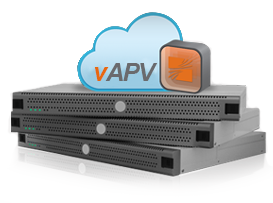 vAPV virtual appliances support a rich server load balancing and application acceleration feature set optimized for local traffic management. In addition, software SSL acceleration combined with server load balancing and application acceleration create a traffic management solution ideal for SaaS, ecommerce environments and applications requiring a high degree of secure connectivity. 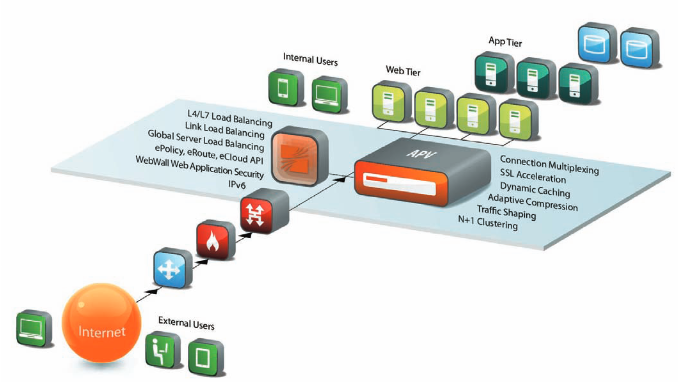 vAPV virtual appliances also include link load balancing and support global server load balancing as an option. Available for popular hypervisors, and available on many popular public cloud marketplaces, vAPV virtual appliances are ideal for organizations seeking to benefit from the flexibility of virtual environments, offer infrastructure services and new elastic business models or evaluate Array application delivery with minimal risk and up-front cost. Dedicated APV appliances leverage a multi-core architecture, SSDs, software or hardware SSL and compression, energy-efficient components and 10 GigE to create solutions purpose-built for scalable traffic management. The APV6600FIPS model offers FIPS 140-2 Level 2 compliance for organizations that require a higher level of security. For multi-tenant environments, the AVX Series virtualized appliances support up to 32 separate vAPV, vxAG secure access gateway, or vAWF Web application firewall instances – each with its own CPU, SSL, memory and I/O resources – with mixand-match licensing and pay-as-you-grow pricing. As an option, APV Series dedicated appliances or AVX Series virtualized appliances may be deployed with vAPV virtual appliances to provide hybrid virtual/dedicated hardware SSL offloading. Weight Single Power: 13.6 lbs. Single Power: 13.6 lbs. Dual Power: 17.2 lbs. Dual Power: 19.8 lbs. Weight Dual Power: 28 lbs. Download the Array Networks vAPV virtual Application Delivery Controller Datasheet (PDF). License will expeire when subscription period ends. License will expire when revenue sharing contract ends. Must pay annual support fee. URL Classification subscription license for vAPV license pack 1 for AVX. One year subscription license only. URL Classification subscription license for vAPV license pack 2 for AVX. One year subscription license only. URL Classification subscription license for vAPV license pack 3 for AVX. One year subscription license only. URL Classification subscription license for vAPV license pack 4 for AVX. One year subscription license only. URL Classification subscription license for vAPV license pack 5 for AVX. One year subscription license only. URL Classification subscription license for vAPV license pack 6 for AVX. One year subscription license only. URL Classification subscription license for vAPV on one AVX instance. One year subscription license only.